In March 2015 when Mufti Muhammad Sayeed took over as Chief Minister his cabinet had more faces from PDP than from ally BJP. The headline “PDP takes lion’s share” was seen as “victory of PDP in taming the BJP”. Later, it was explained as “alliance understanding”.In the subsequent two years, the BJP-PDP, termed “north pole-south pole” alliance by PDP patron, “unpopular” by its president and “unholy” by their detractors had many tiff-offs. Tensions started quite early, in fact, hours after the Mufti’s maiden press conference. After the generational shift in PDP, tensions between allies have deepened. Now they are coming out of the closet, recent events suggest. The “arrangement” that the two partners will have two seats each in six upper house seats exposed both of them as the plot went off the script. A “major blow” to PDP came when BJP “managed”the independent lawmaker from Zanskar Syed Baqir Rizvi to vote against PDP. Later after keeping on hold Doda MLA Shakti Parihar for around three hours, he was finally directed to vote for his own party. I taught PDP a lesson for dis-respecting me,” Baqir said, accusing Naeem Akhtar of blocking his cabinet entry. BJP had to cast one vote for PDP candidate Abdul Qayoom Dar (Rajouri) but instead, it got its candidate Vikram Randhawa elected. Of six seats, BJP got three, NC, Congress and PDP, one each. In House of Elders, BJP has 11 berths, as many as PDP has! PDP insiders say Syed Baqir was “managed” by BJP. “Someone from independents voted for our candidate. Don’t we know who he was? Maybe, he is someone from Kashmir,” Sharma said. By then PDP had sacked Baqir as Vice Chairperson of Workers Construction Board, withdrawn his facilities including his ministerial status. “I taught PDP a lesson for disrespecting me,” Baqir said, accusing Naeem Akhtar of blocking his cabinet entry. By the time, Mehbooba Mufti had shown her displeasure, her ally had spiralled up another issue. Finally, when Mehbooba presided over the meeting, Dr Nirmal Singh, her deputy, stayed away: he had gone to his constituency. He came at 6 PM but no new meeting could happen. In the meeting, “there were heated arguments between ministers from Kashmir and Jammu over the videos of using force on youth. “BJP did not budge an inch from their stated position,” sources said. Ganga was part of the meeting. Finally, the cabinet expressed anguish over the loss of lives and urged parents to counsel children, a statement issued to the media said. What actually went wrong is a question even a commoner is asking. 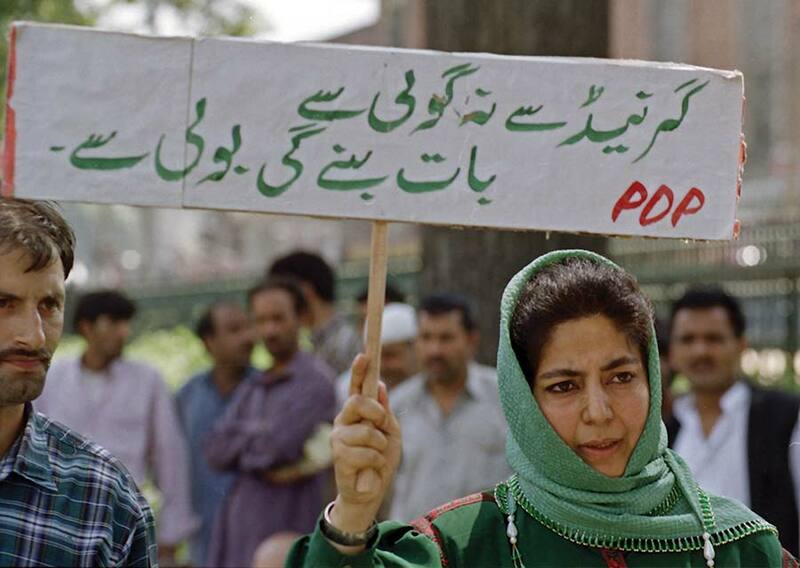 “The boycott could have been peaceful also, but the anger on streets on the polling day and subsequent death of nine people is a crisis,” a scribe reporting Kashmir from last many years told Kashmir Life. “Words are more detrimental than deeds, believes a middle rung official. “There was no remorse from the government about the killings, injuries, and abuse of pellet guns in 2016. The fuel is being added continuously by making anti-Kashmir statements.” The officer said Mehbooba’s toffee remark will haunt both Kashmir and PDP for long. PDP’s youth leader Waheed-Ur-Rehman has constantly argued for “parenting rather than policing”. But the police his government controls barged into the college, outside his Pulwama home, and pushed Kashmir to a new weeklong crisis. PDP’s youth leader Waheed-Ur-Rehman has constantly argued for “parenting rather than policing”. But the police his government controls barged into the college, outside his Pulwama home, and pushed Kashmir to a new weeklong crisis. The only reaction of the government was to attach the college principal, his close relative!PDP government wants “peace”, says Muhammad Muzaffar, a businessman from south Kashmir, insisting it cannot be created in a vacuum. “Where is the effort to get peace?” he asks. A general belief is that “Kashmir has Doval doctrine in vogue”. Ajit Doval, the NSA, once said: “Do not overreact, it will pass off as they cannot sustain beyond a point. The bigger crisis for PDP is its failure to get its Agenda of Alliance (AoA) implemented. Two years have already lost. Even Omar Abdullah wants its implementation. 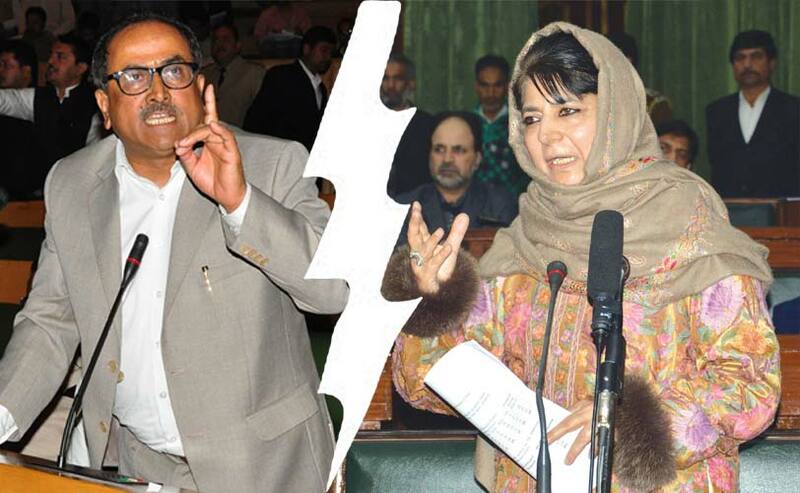 “PDP lawmaker Javid Mustafa Mir was blunt and brute after the March encounter in Chadoora. “It is a case of targeted killings and Mehbooba is responsible for it as home minister of the state,” Mir said. “She got the three youth killed.” These killings followed army Chief Bipin Rawat’s warning to protesters: “If they do not relent and create hurdle in our operations, then we will take tough action.” Interestingly, there was a lone militant with just a pistol! But the fact is the document is gathering dust. “BJP is managing its part without an Agenda and PDP is unable to implement even what is promised to them,” admitted a PDP young man. Even governance is impacted. The partners are at loggerheads on the administrative front as well. “It is like two governments running the state in their own way,” a secretary-level officer said. Then came the embarrassment when Speaker directed to “expunge” statement of a leader of the house. “Those working to scrap Article 370 will be doing a big anti-national act,” Mehbooba had said. Speaker Kavinder Gupta’s assertion suggested BJP goes against Agenda of Alliance by reiterating the position that it needs Article 370 to go. Social media was abuzz recently with stories about how Mehbooba was sidelined when Modi inaugurated Nashri tunnel. Social media was abuzz recently with stories about how Mehbooba was sidelined when Modi inaugurated Nashri tunnel. Press Information Bureau (PIB) released a photograph that showed Mehbooba as a waiting player in the event forcing state’s Information department to release a new photograph. Tensions are being felt in administrative issues as well. “In case of Jammu bills, nod comes so easily but in Kashmir, case queries are raised again and again,” admitted one official. While crop insurance was extended to all Jammu districts for all crops, the government has not yet been able to rope Atal Fasal BeemaYojana for Kashmir. “Some companies evincing interest say they would insure only maize and paddy leaving out major crops like apple and saffron,” insiders in government said. 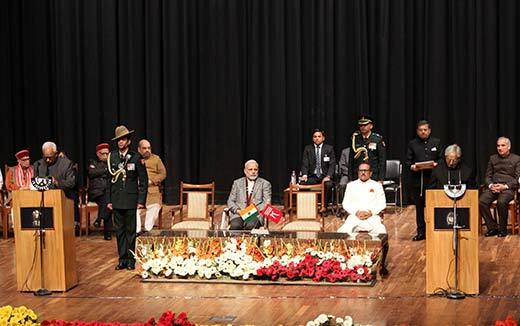 “It is strange that the government had invited separate bids for Kashmir and Jammu regions instead of inviting a single bid for the whole state,” Informed an official, privy of the developments. With money in bank, JCCI president, Rakesh Gupta launched a “identify and kill” campaign against the Rohingya Refugees and Bangladeshis in order to force them out of Jammu. Though Mehbooba said “action will be taken”, there was no follow-up. In an attempt to boost the business chambers of both the regions, the government approved Rs 25 lakhs for each chamber. The money stands disbursed to JCCI while its counterpart in Kashmir has not received a penny. With money in the bank, JCCI president, Rakesh Gupta launched a “identify and kill” campaign against the Rohingya Refugees and Bangladeshis in order to force them out of Jammu. Though Mehbooba said “action will be taken”, there was no follow-up. An insider in tourism said, “Jammu is giving tough competition to Kashmir”. An additional Deputy Commissioner rank officer told Kashmir Life that how Central University in Jammu is running, while there is no progress in the valley.